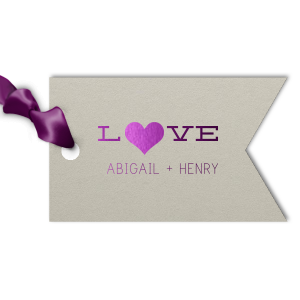 For Your Party custom Favor Tags are made from top-quality paper in the shape and color of your choice. 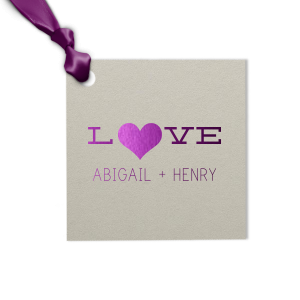 Colors are coordinated as closely as possible to match our napkin colors, but may not be exact. Custom tags can be personalized on one side. 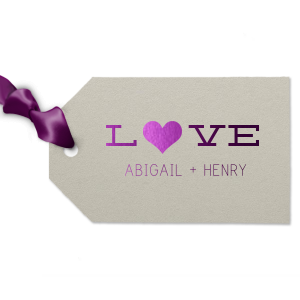 Our beautiful custom Natural Gray Luggage Gift Tag with Shiny Amethyst Foil Color has a Heart Solid graphic and is good for use in Hearts themed parties and can be personalized to match your party's exact theme and tempo.